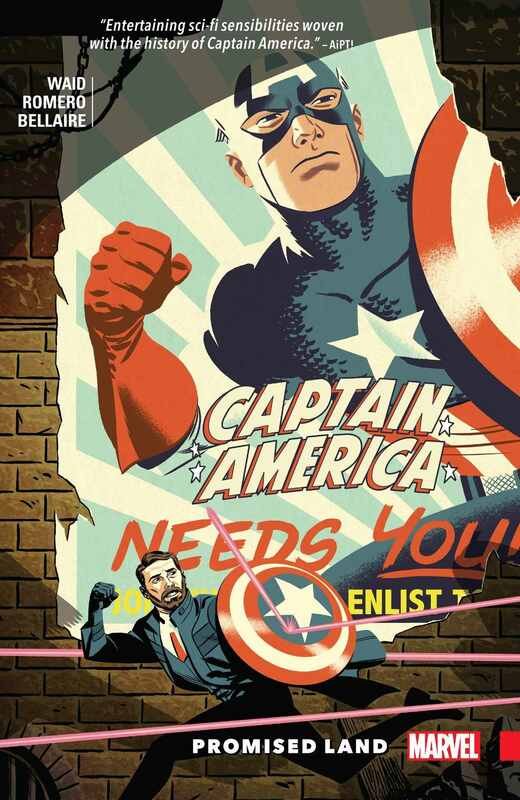 Mark Waid's 'Captain America: Promised Land' explores the "perfect" future of the Captain America world – AiPT! Collecting the entire four issue series following the descendants of Steve Rogers, Promised Land uses sci-fi tropes and Captain America’s past to explore a future world made perfect by the serum. This series was ambitious in many different ways — not only was it starring a non-superhero in a book called “Captain America,” and setting the book in the far future, but using several different artists not only from issue to issue but sometimes within issues as well could have ended up with a big mess. Instead, Mark Waid’s ambition paid off with a solid sci-fi story and a bit of a morality play about what parents will do for their children, what our ancestry means for our future, and what we own one another. One thing I’ve always loved about Cap as a character is that at the core, his actions are rooted in helping others and fighting for peace. This series extrapolates that idea into this story, where Captain America’s DNA helped create a serum that made almost everyone, human and alien, healthy and free from disease and much longer lived. America is a shining beacon of peace, extending out into the galaxy. Of course, that peace is a ruse, also tying back in to Cap’s time, with some of his greatest villains coming back into play. This book feels like a love letter to classic Captain America, with scenes from various points in his continuity sprinkled throughout the story, tying into the future story. I love that they used a scene with classic Cap and Young Bucky from WWII to open the first issue, and having Adam Hughes and JG Jones really lean into the classic style helped define the era. In fact, each artist who illustrated a flashback seemed to play into the art style from that period — I especially loved the scene from issue #703. I felt like I was looking at scenes lifted from an ’80s Marvel book. I also have to give huge props to Michael Cho’s absolutely gorgeous covers. His dynamic layouts and rich, bold colors were huge standouts in an already bold book. There are some bones to pick, of course. The sci-fi technology of the hospital played again the almost steampunk elements of the historians and time lenses was a fantastic juxtaposition, and beautifully realized by Leonardo Romero’s gorgeous art and Jordie Bellaire’s dynamic colors. However, the ending solution felt a bit hand-waved, I’m still not sure I understand what happened there. There also felt like there were a few too many reverses and misdirections, though that may have played out better in a monthly book than reading it all in one sitting. I’m also generally not a fan of books that use a lot of internal monologuing. It feels like telling rather than showing, but that’s just a personal preference, and since the story is first-person, I can see why Waid used the device. Overall, I think Mark Waid and team did an excellent job with a challenging premise. I can’t help feeling like Waid was not only thinking about a future in a comic book world, because I saw ties into current events as well. The book left me feeling hopeful, and that’s never a bad thing. Overall, I think Mark Waid and team did an excellent job with a challenging premise. I can't help feeling like Waid was not only thinking about a future in a comic book world, because I saw ties into current events as well. Challenging premise to use multiple artists, but definitely pays off. Each artist has a lot of fun playing with their era. Shoutout to Michael Cho's incredible covers for each issue.